On Thursday the 8th of October, myself and John Courtman took Sutton Council’s Cycling Champion and Councillor, Manuel Abellan, on our third ride around the borough. This time we were looking at Cheam and the surrounding areas. We started in Cheam Village and agreed that it was a very car dominated High St. The suggested route for cycling into Cheam from Sutton goes down the side of Sears Park (where there is a cyclist dismount sign) and then across the A217 at the crossing shown in the picture below. Obviously this is far from ideal and would certainly be off-putting for cyclists as the cars are travelling very fast and it can be very busy. The route then goes down Love Lane and Park Road and comes out opposite Whitehall in Cheam. There is a dropped curb and a cycle path here to take you over the lights and on to Cheam Park. Manuel thought that this was a useful piece of infrastructure and that it could certainly be updated and improved upon. We then headed down Malden Road that leads to North Cheam. It is an important route used by a lot of commuter cyclists and it is very busy, hilly and narrow. We didn’t think there was room for a fully segregated cycle path both ways and we talked about removing some parking to have a cycle lane towards Cheam, when you are going uphill, but this also seemed pretty difficult. We headed back to the A217 to join up with the part that we previously cycled with Manuel on our Rosehill Ride. The cycle path alongside the A217, essentially giving a segregated route all the way from Cheam to Morden, is a fantastic thing to have in the borough but there is huge room for improvement at the junctions and it is also in dire need of maintenance to the surfaces. The first junction that we looked at was where Lumley Road joins at A217. As can be seen from google streetview, there are often a queue of cars waiting at the give ways lines blocking the path of a cyclist using the cycle path along the A217. This can be particularly dangerous as due to the bend in Lumely Road and the fence that is there, cars are not able to see a cyclist on the cycle path going North until the last second if they are zooming up to the give way lines. Drivers are often waiting at these give way lines for quite a long time and seem very impatient, particularly when there is a queue of 6 or seven cars waiting to get out. Whilst we were looking at the junction with Manuel, a cyclist came along from the North, got off his bike and crossed the road 2 cars back then walked to the cycle path and got back on. It can be very difficult to work out when it is safe to cycle across the junction, not only because of the queueing cars but also drivers turning off the A217 at speed. This really needs a re-design to be safe for cyclists and the situation is similar at the junction with Church Hill Road as well. Heading on further down the A217 cycle path we came across these bollards which seem to serve no obvious purpose whatsoever! I can only assume that they are there to tell you that you can cycle on the cycle path but are only really an obstacle to cyclists. Manuel had no idea either. They are fairly easily avoidable, but why put them there in the first place? Then we carried on to where Gander Green Lane crosses the A217. First of all we looked at the side of the road with The Gander pub on it. There is already a cycle lane here but it is very poor and goes from the pavement, down on to the road and then back up on to the pavement again. Manuel suggested that it would be better if the path just stayed on the pavement and that the obstacles (lamp posts and cctv cameras) were moved somewhere else. There would be no need to keep it for pedestrian use as there is already a normal pavement outside the shops and pub. The junction on the other side of the road, coming from Sutton is also very poor. There is a section of pavement here that could easily be made shared use but is currently not (thought I think most people just already use it). If you are coming from the direction of Sutton down Collingwood Rd or Gander Green Rd and want to get on to the A217 cycle path to head to Rosehill it can be a bit tricky. You can go through the traffic lights, turn right on to the A217 and then try and get off it again and on to the path, in which case you might as well just stay on the A217; or you can get off your bike on the left at the traffic lights and then wait to cross the 2 sets of lights which is a bit convoluted; or you can get in the right hand lane as if you were turning right and then wait for a gap in the oncoming traffic, go on the wrong side of the road and then up on to the pavement, which I have seen a lot of people do. There needs to be better access to the cycle paths at these junctions and Manuel suggested that there might be room to make some improvements if some of the railings were removed. We carried on down the Sutton side of the A217, noting the poor quality of the surface on the cycle lane and the state in which it is kept. 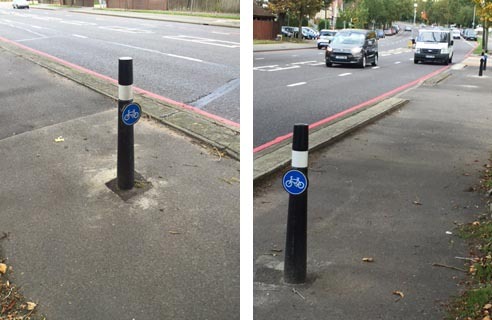 The photo above shows a particularly bad patch just after where the cycle path goes through a bus stop (!). It is always full of rubbish which I think must be swept in there from the road, however no-one seems to sweep the cycle path. I have reported this before to the council, as has another member of Get Sutton Cycling, but nothing has happened about it. Manuel can be seen pointing to a stretch of pavement with a clear no cycling sign but there doesn’t seem to be any reason why cycling is not allowed on it. It is no narrower than other sections where cycling is allowed and would mean that some cyclists would be able to stay on the same side of the road if it was easier for them to do so. We then crossed at the crossing and continued to Kimpton Park Way and down the Pylbrook path on our way to the newly partly paved cycle path off Trafalgar road. The Pylbrook path is a nice way to cut out some of the busier roads however at the end of it you are then faced with the A24 London Road. If this is to be a joined up route to Worcester park and Motspur Park then there needs to be a safe and convenient way for cyclists here to cross the A24. At the moment the only options are to put your bike in the road and then quickly do a tricky right turn into Trafalgar Ave or to walk along the pavement a bit, cross at the zebra and then walk back down the other side of the road to Trafalgar Ave and then get back on there. The cycle path that comes off of Trafalgar Ave and goes behind the Hamptons has recently been paved up to the Hamptons and then continues unpaved. This is a far better surface than previously but certainly not where I would have prioritised the money. The newly paved bit offers an alternative to cycling along Charminster Rd and then Boscombe Rd which are quiet residential roads. If you are thinking of cycling this route, it’s not these two roads which are going to put you off! If you do cycle down the new path, at the end of the newly paved section there is a gate to squeeze round and then the path continues as a lumpy dirt track. Paving this second half first and removing the gate would have made a lot more sense as this bit has no direct alternatives for cyclists. Also, at the other end of the path there are more gates and if you continue to Motspur park there is a no cycling sign but I think by this point you might be in Merton. Overall, another useful and enjoyable trip with John and Manuel. Next time, in December, we are going to tackle Worcester Park and North Cheam. If you have any spots that you would like us to visit please let us know! This is an excellent analysis of some of the main issues in this area. I started cycling in Sutton in autumn 2015 and use a cargo bike to carry two children (and my five year old is also learning to ride her own bike), so I am particularly interested in finding safe routes around the borough. My top issue has to be the crossing of the A217 from Seears Park as this is a crossing we make every day as part of our school run. You can’t ride on the pavement to Cheam crossroads where the traffic lights are, and the other nearest crossing with lights is near Alberta Avenue, and then you run into the issue getting across the Lumley Road junction that you mention. Even as a pedestrian, but especially one with small children, it is pretty scary balancing on a tiny traffic island in the middle of the A217, not to mention the fact it sometimes takes about 10 minutes for the traffic to be sufficiently quiet to get across. That traffic island is very well used by families with children, dog walkers from the park, as well as cyclists. I would love to know if anything can be done about it, and how best to campaign for safer roads for pedestrians/cyclists in Sutton more generally. Many thanks for your comments and suggestions Rosalind, and it is really good to know that you are interested in finding safe routes around the borough to cycle with your children, and that this includes use of a cargo bike. Your top issue, crossing the A217 at Seears Park, is one of our top issues too! It was featured in our discussions for improvements in the borough, as presented to Sutton councillors, in 2014. So what has happened? Well, in September 2015 Sutton Council produced a report based on some of these suggestions for presentation to Transport for London subject to approval from councillors. 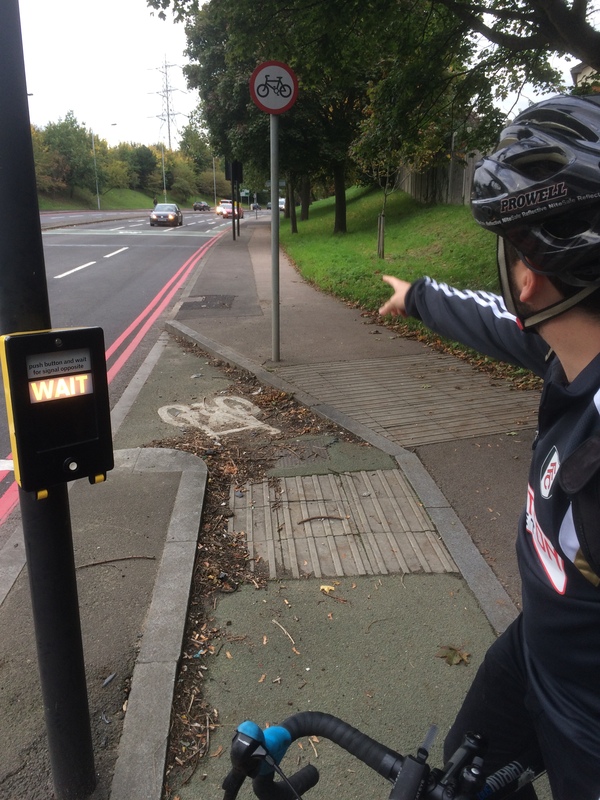 You can read about this here https://getsuttoncycling.org.uk/2015/10/25/major-cycling-schemes-for-tfl-roads-to-be-presented-to-councillors/. Although this report was received favourably by four of the five local committees to which it was presented between October and December 2015, one committee (St Helier, The Wrythe and Wandle Valley) did not agree to ideas for Rosehill roundabout (https://getsuttoncycling.org.uk/2015/11/02/st-helier-summary/). This rejection seems to have stopped everything in its tracks. Consequently, over six months later, and as far as we are aware, the final version of the report for presentation to TfL has not yet been written – although we believe this may progress in June. I think the best you can do at the moment is to let your councillors know that you find crossing the A217 with young children quite scary. You could do this by email or you could call in and see them at one of their monthly surgeries. By all means mention us if you would like to, of course. You are always welcome to drop us a line at getsuttoncycling@gmail.com, or through this website, to discuss further. I can understand that our evening meetings may not be convenient for you, and we are looking for ways to extend our engagement with people across the borough beyond those meetings. So, all suggestions welcome, and please keep an eye on the website! Thanks for replying and for letting me know the story so far! I have emailed the Sutton West councillors this morning asking then what they are doing to support cycling, and mentioned the Get Sutton Cycling group and blog suggestions for improvements. I will update if/when I hear anything back.